The installation of racking upright protectors or column Guards safeguards the uprights / frames in your pallet racking system, which are vulnerable to accidental fork lift truck damage, as well as providing a safer working environment in your busy warehouse or factory. 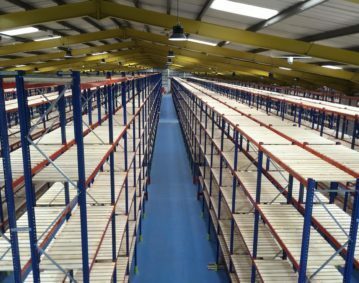 Pallet racking upright protection is a worthwhile investment the cost of the average upright repair can be up to £1000.00 including a team and access platform hire the cost of upright protection starting from less than £15.00 is a worthwhile investment. We recommend the ballistic grade polymer upright protection which is extremely durable and comes in a high visibility finish making it easy to see for picking and replenishing the pallets again minimizing damage. We have fitted and supplied thousands of pallet racking upright guards in a wide range of warehouse and production facilities and customers have always been very pleased with these products often going on to buy further upright protection after a trial sample. Rack Protectors are available in a high visibility orange or yellow. Alternative colours are available such as green or red to mark safe havens or first aid points.